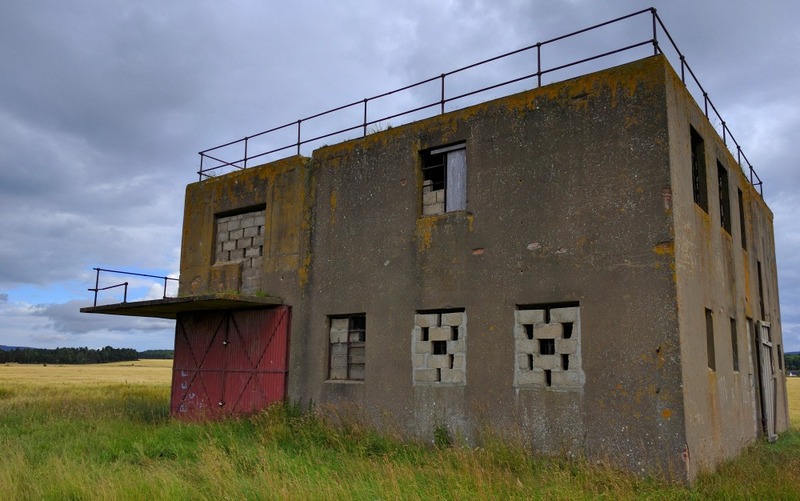 RAF Dallachy - exploring Moray's wartime past. Scotland is pretty well interpreted from a visitor point of view, I think. Sometimes though, the past is easily overlooked, its memorials too easily passed by. In spite of us caring to ensure that visitors can easily find out about their locality, there are still places where you have to dig around - or just be very observant - to find out the significance of a place. The east bank of the River Spey looking (perversely!) upstream from the mouth. The bridge formerly carried the old Great North of Scotland railway line that went along the coast. Now it's a walkway and cycleway. RAF Dallachy lay beyond the trees, on the far left. Take for example, the mouth of the River Spey in the old county of Moray. Summer haunt of ospreys, unpredictable hunting grounds for our Moray Firth dolphins, the estuary here has a carpark at the road end that is nearly always busy. The Whale and Dolphin Conservation Society have a wee cafe and gift shop here. RAF Dallachy Strike Wing Memorial. No, this informative place has some of its wording in gilt letters, carved in stone. It should still be there when all these other plastic panels have crumbled and faded away. It is the solemn memorial to RAF Dallachy, an RAF Coastal Command Strike Wing airfield. You can find it on the east side of the road at Bogmoor. Probably the red of poppy wreaths will catch your eye. What is left of the taxiways and runways is just a few minutes walk away. There are no other information panels in the immediate vicinity. Only a curious foursquare mostly boarded up structure in a barley field. This was the control tower. Deviate from the main A96 to Spey Bay road via the cosy bungalows and cottages of Nether Dallachy and you will find yourself driving round what was the perimeter track of the old airfield. At several points the distinct bow-shape of dispersal points on either side of the road are quite plain, though I don’t imagine that folk, unless they look at the Google street view of the Spey Bay area, recognize them for what they are. But just imagine, if you had come along this way over 70 years ago. You would have been within the airfield boundary and you might have met, coming the other way, a squadron of taxiing aircraft, each with two big radial engines roaring. There’s a westerly blowing and you might have seen them reach the eastern side of the field, turn into wind and take off. Imagine, the crew probably glimpsing the River Spey below them, with its braided estuary channels, before they began their turn out, over and beyond the big shingle beaches that run round to Lossiemouth. Then it was away to the north-east because the planes were bound for Norway. Drama and death distilled into a paragraph or two at RAF Dallachy Strike Wing Memorial. And, some of the young men were already far from home, because 404 Squadron of the Royal Canadian Air Force was here, as was 455 Squadron Royal Australian Air Force and 489 Squadron Royal New Zealand Air Force, as well as units from home. 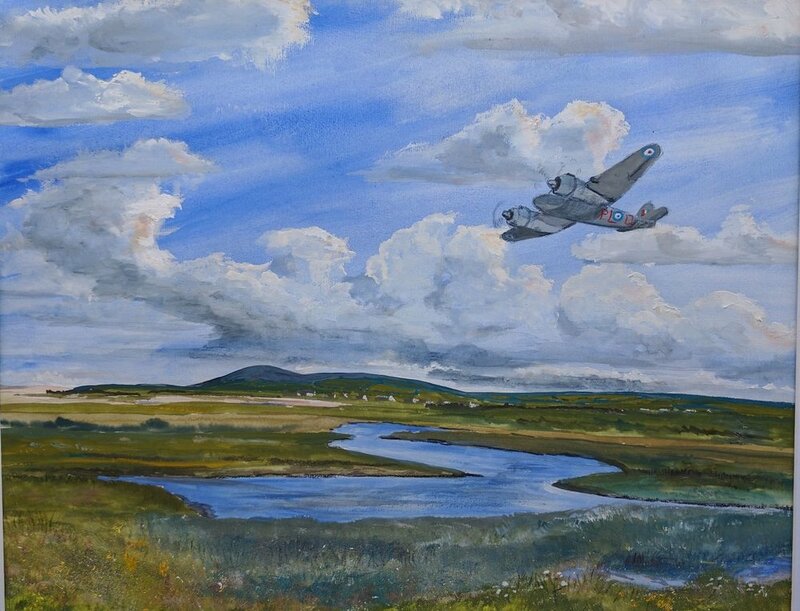 And, especially, if somehow you had seen them take off on the 9th February 1945, you would have seen aircraft that left the ground here, in this tranquil stretch of coastal Moray, and never returned. Neither did the young men who flew them. That date, almost at the end of World War II, became known as Black Friday in the annals of Coastal Command, when the Dallachy crews suffered their greatest loss of any Strike Wing in a single operation. What is left of the RAF Dallachy control tower, lost in the barleyfields of rural Moray. Bin Hill of Cullen on the right. But if you are wandering down to the mouth of the Spey, on the east side, look out for the memorial at Bogmoor. Park, if you can. Walk through the gate that leads to the control tower. Maybe even walk a bit of the perimeter track. Perhaps you’ll walk far enough to find yourself at the end of the runway, probably meeting the odd dog-walker on the way. Actually, there are two runways that cross each other like open scissors. Half of one is now occupied by the detritus of a recycling centre. Oi! Get off that bike - the concrete hasn’t set yet! One of several moments frozen in time on the runway at RAF Dallachy. Look closely both on the southern perimeter track and at the western end of the main runway and there are the tiniest glimpses of the past, presumably dating from the winter of 1942-3 when the runways were under construction. Set into the concrete are footprints: a naughty dog or two, a tentative roe deer and a few enquiring birds (probably crows), as well as the hobnail boots of someone I like to think of as the foreman of the concrete laying squad. 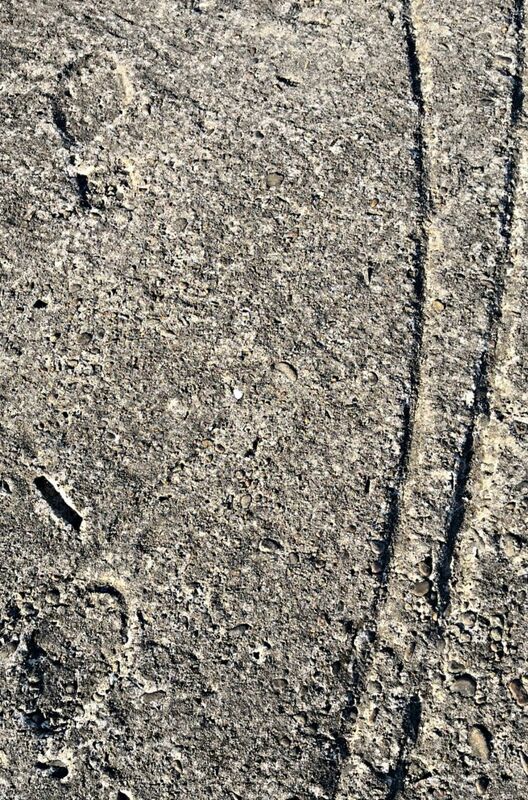 There are bike tracks as well, including one who seems to have got off his machine when he realised he was leaving his mark. I like to imagine him as ground-crew perhaps, with the civilian workmen in the squad shouting at him to get off their latest bit of cement-laying! Today, it’s a tranquil scene, with the birds of summer, the yellowhammers and whitethroats, singing - and abandoned bits of farm machinery and silage bales on concrete hard standings that once saw busy ground crews working to keep their aircraft at readiness. And then there is that lonely control tower with its ghosts. Where the planes once thundered past, the runway has returned to nature - knapweed, yellow-rattle, vetch and, most pognant of all, the bluebells of Scotland, have found a home. Talking of which, the main accommodation blocks were on the higher ground to the south (I believe.) Their remains - mostly just foundations - are now deep within woodland. Matter of fact, I tried to take the dog a walk there during the winter. He wouldn’t budge as soon as I entered the wood. Refused to come another step. Spooked me, let me tell you! Just saying. Mind you, he is a comfort-loving Border terrier. Anyway, today there is the memorial, there is the control tower and the silent vanishing runways. And a street called Beaufighter Road which runs into the village and along much of the northern and eastern parts of the perimeter. Just a few minutes' drive from Dallachy, the community museum at Fochabers has a lot of background on the wartime role of the airfield. It also has the sobering exhibit of a Beaufighter crew seat with a cannon-shell hole in it - from the 'Black Friday' operation mentioned above. The shell wounded P/O 'Spike' Holly and their aircraft crash-landed in a fjord. Holly and P/O P.C. Smith were taken prisoner. Lots more detail in the highly recommended museum - and information on 144 Squadron RAF on this link. 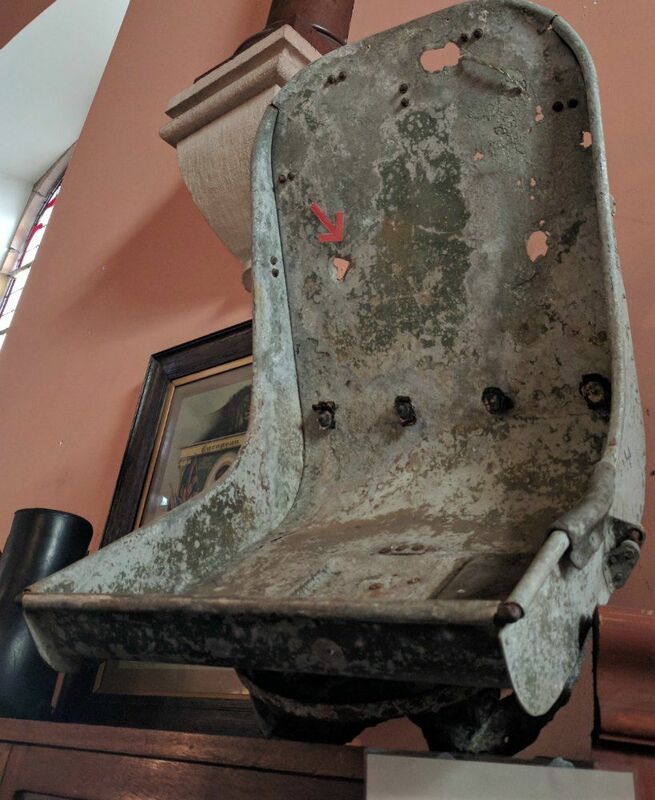 Along with some other relics from the crash site, the seat was recovered from the fjord by Norwegian divers in 1979 - and actually given to P/O Holly! Those Strike Wing crews were based in rural Moray for the last six months of the war. And they flew off across the grey sea and saw and did terrifying things amid the mountains and fjords of occupied Norway. Worth a few minutes of your time, just to remember them, wouldn’t you say...before you go down to the peaceful and endlessly-flowing river? Beaufighter circling over Dallachy. In gouache. Just an impression...If you would like a print of this, then get int touch, will you? There are more of our Scottish landscape prints on that link.